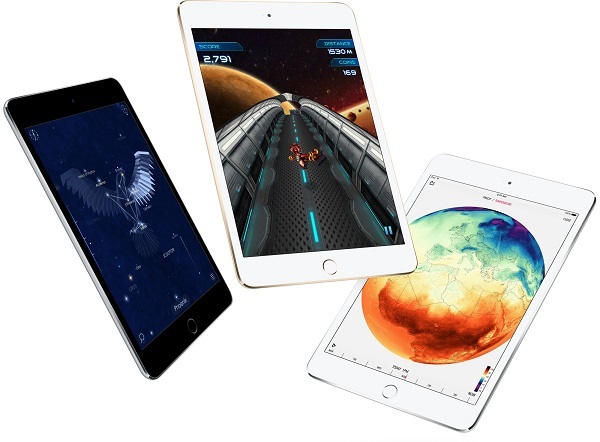 How Much Do You Know About iPad Mini 4? iPad Mini 4 is the fourth generation of iPad Mini tablet, announced during Apple Special Event along with iPad Pro and Apple TV. Compared to iPad Pro, there is less focus on the new Mini 4. How much do you know about iPad Mini 4? In fact, it is much worthwhile to get more details about iPad Mini 4. 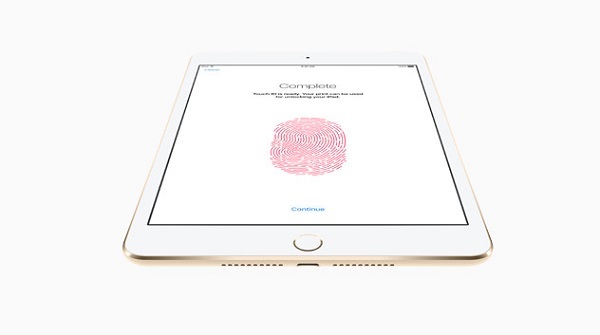 Lighter and thinner, iPad Mini 4 puts everything you love about iPad into a sleeker, slimmer design. It’s a perfect size to carry everywhere especially for a long plane ride. Apart from its size, there is a better display about layers. iPad Mini 4 combines the three separate layers into one which eliminates gaps between layers, along with the internal reflectance caused by those gaps. Besides, it features a custom-designed antireflective coating that reduces glare by 56 percent compared with previous iPad displays, making everything clearer and more readable. iPad Mini 4 is powered by an A8 chip with second-generation 64-bit desktop-class architecture that can handle even your most demanding apps. And with up to 10 hours of battery life, you will have plenty of time to enjoy yourselves by playing games or watching movies. During your time, you will find that all your actions happen quickly and smoothly with a 30 percent faster CPU performance. 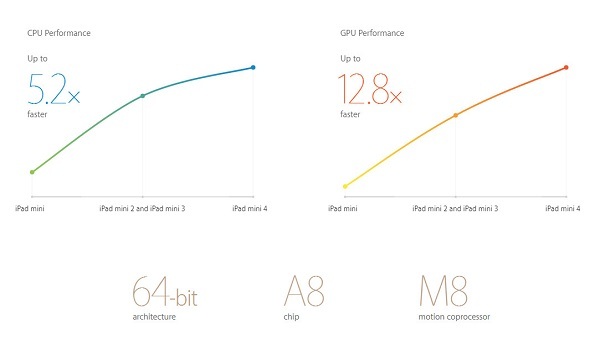 Thanks to the A8 chip, iPad Mini 4 boasts graphics once possible only on desktop computers and gaming consoles. Graphics-intensive apps run superbly and look gorgeous on the beautiful Retina display. The iSight camera in iPad mini 4 delivers advanced optics, an improved sensor, and an Apple designed image signal processor, helping you capture all of life’s moments at a moment’s notice. 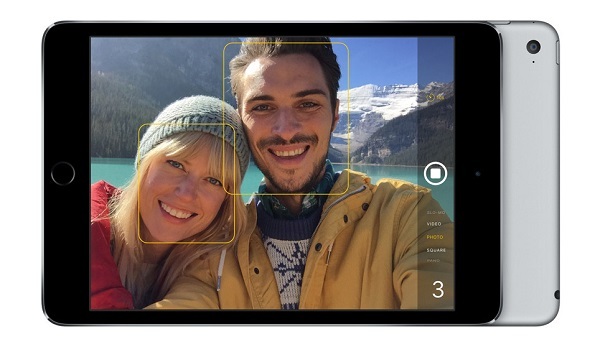 The front facing FaceTime HD camera has been redesigned, too. With a refined sensor and larger pixels for even better low light performance, video calls become clearer than ever. It’s just like that the two video callers are in the same room even though they are not. What’s more, the two amazing cameras can do more than take photos and videos. Try some wonderful apps to do other remarkable things. As an advanced security, Touch ID technology enables to turn your fingerprint into the perfect unforgettable password. So you can unlock your device with just one touch and keep your personal data secure, even if you share your iPad with someone else. Touch ID also lets you make secure purchases in iTunes, iBooks, and the App Store. And with Apple Pay, you can make purchases within your favorite participating apps quickly, conveniently, and securely. Being an Apple device, iPad Mini 4 is able to play iTunes purchased and rented movies. When you enjoy purchased iTunes movies, you can watch them anytime and anywhere. But there are some limitations of iTunes rentals. For example, iTunes rentals can only be available within 30 days and you must finish watching within 24 hours once you begin to watch. All these limitations are due to DRM (Digital Right Management). If you would like to get rid of the limitations and keep iTunes rentals forever, you can try NoteBurner M4V Converter Plus. NoteBurner M4V Converter Plus is a professional iTunes DRM removal tool which can remove DRM legally from both iTunes purchases and rentals. Also, you can convert iTunes M4V files to other popular formats so as to be played on iPad Mini 4. After conversion, the rentals are DRM freed and just like purchases without any limitations.